Researchers studying the evolutionary dynamics of bacteria and viruses in bubbling glass tubes have confirmed an evolutionary theory of central importance to ecologists studying more familiar flora and fauna in the wild. The theory predicts how the movement of individuals between different populations of a species influences evolutionary change in those populations, particularly with respect to coevolutionary interactions between species. This is an important issue in understanding the long-term effects of the increasing fragmentation of natural habitats due to human activities. Many ecologists believe that fragmentation of the natural landscape, by separating communities of organisms that had been connected, has the potential to alter the evolutionary processes that enable organisms to adapt to changing local conditions. This study provides hard evidence to support that view. The study, published in the October 14 issue of the journal Nature, looked at the coevolution of a common type of bacteria, Escherichia coli, and a virus that infects it, called bacteriophage T7. 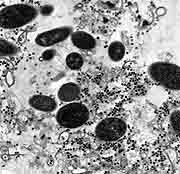 The researchers were able to track adaptations that arose in both bacteria and virus populations and show that the pattern of adaptations depended on both the environment in which the organisms were growing and the spread of genes between different populations. Ecologists use the term "gene flow" to describe the spread of genetic variants that accompanies the movements of individuals. This study provides the first direct empirical evidence that gene flow across a heterogeneous landscape can alter the dynamics of coevolution. "By working with microbes that go through about ten generations per day in the laboratory, we were able to track evolutionary changes through time and answer questions that previously had only been addressed theoretically," said Samantha Forde, a postdoctoral researcher at UCSC and first author of the paper. Forde's coauthors are John Thompson, professor of ecology and evolutionary biology at UCSC, and microbial ecologist Brendan Bohannan of Stanford University. Forde conducted the study as a postdoctoral researcher in Bohannan's lab at Stanford. According to Thompson, the history of evolution and the diversification of life on Earth is fundamentally a history of the evolution of species interactions, or coevolution. Thompson is a leading proponent of the geographic mosaic theory of coevolution, which emphasizes that every species is a collection of genetically distinct populations that are linked across landscapes, resulting in complex geographic mosaics of species interactions that can evolve differently in different locations. "We have a pretty solid theoretical framework for explaining coevolutionary interactions between species and how coevolution organizes biodiversity through networks of interactions across landscapes," Thompson said. "These experiments are one step in actually translating that theory into predictive analyses of natural populations." The experiments used a simplified system in the laboratory to test the predictions of the theory. The basic coevolutionary dynamics of E. coli bacteria and bacteriophage T7 are well known. When T7 is introduced to a population of E. coli, the bacteria soon evolve resistance to the virus. The virus, in turn, evolves to attack the resistant bacteria, and then the bacteria are able to evolve a second level of resistance to the more potent form of the virus. According to Bohannan, microbial experimental systems have become increasingly popular in ecology, due in part to the degree of control they offer and their relative simplicity. "Coevolutionary change happens rapidly in these communities and can be easily detected. Furthermore, the genes underlying these coevolutionary changes are known and accessible to study," Bohannan said. Forde set up microbial communities of bacteria and viruses with different nutrient levels in a series of chemostats--glass culture tubes that provide nutrients and oxygen and siphon off wastes. In one set of chemostats the communities remained isolated from one another. In another set, Forde periodically made a series of transfers between communities, sucking up a pipette full of bacteria and viruses from one chemostat and adding it to the next one, and so on down the line. She also periodically analyzed the populations of bacteria and viruses in each community. "I created in the laboratory a fragmented landscape with communities of microbes growing in different local environments, and then I looked at what happens over time when the fragments are isolated and when there is gene flow between fragments," Forde said. In the isolated communities, resistant bacteria--and viruses able to overcome that resistance--evolved more rapidly in the chemostats with high nutrient levels than in those with low nutrients. That's because the microbes multiplied more rapidly in the high-nutrient environment, resulting in more opportunities for favorable mutations to arise. The dynamics of coevolution were altered, however, by the dispersal of organisms between communities. In general, dispersal from high-nutrient to lower-nutrient communities sped up the rate of adaptation in the lower-nutrient communities by bringing in novel genetic mutations. Forde also found that gene flow increased the variation in coevolutionary dynamics through time. "We had a pretty simple system, but the results were relatively complex. We found that adaptation can vary in both space and time across a heterogeneous landscape. It's mind-boggling to think about how these kinds of coevolutionary interactions could vary in nature when so many other factors are involved," Forde said. Thompson has spent decades studying the mind-boggling variability of coevolutionary interactions in nature, with much of his work focusing on interactions between plants and the insects that pollinate flowers and feed on plant parts. Both the ecology and the genetics involved in these natural systems are highly complicated, however, and even long-term studies can only address a limited number of questions, he said. "This laboratory system gives us a halfway ground between the mathematical models and natural populations. It allows us to test whether our assumptions are realistic, and that puts us in a better position to design experiments in natural populations," Thompson said. Forde has also done extensive research on natural populations, studying invertebrate communities on rocky shorelines as a graduate student at UCSC. But she isn't done with the microbes in the chemostats yet. She has stored samples from the chemostat experiments in a freezer, awaiting genetic analysis. She plans to look at the genes involved in the coevolutionary interactions, identify specific mutations, and trace the genetic dynamics of the interactions through time. "It's like having a fossil record of the viruses and bacteria. I can study their genes and see how dispersal influenced their evolutionary histories," Forde said. In addition to providing general insight into the process of coevolution, understanding of the evolutionary dynamics of microorganisms is crucial to a number of fields, including human medicine, Bohannan said.